Occasionally I will get the type of client that has difficulty seeing the big picture. Not a bad thing at all, a lot of us are visual people! I totally understand. However, the hardest part has already been achieved- messaging me with wanting to give your pieces a Second Chance. It can be scary for first time clients. I am here to make this process enjoyable, stress free and your pieces lasting another lifetime and beyond. She has a dining set and hutch that she wants refinished but because she was having a hard time envisioning it I offered to first do a chair so she could see it in her home and make sure she was happy with our color consultation choices. As well as give her the opportunity to feel her piece of furniture. To see that her piece is contractor grade, not paint slapped on . I am in the midst of working on her table as she is head over heels with how her chair turned out. Here is the first piece I did for her, a dining chair, that helped her have faith! Stay tuned in as her dining table is next and a matching hutch to come soon. Refinished in Sherwin-Williams Greek Villa, lightly glazed in Brown. Seat reupholstered in a grey vinyl from Joann Fabric Store. My client has this baby gate custom built and brought to me to be stained. She chose to match her cabinets, Warm Chestnut by Wood Classics. I hope everyone had an exciting Easter and a wonderful month in March. My littles enjoyed their spring break the last week of the month following into Easter and we were busy with fun, friends and the start of our two home projects! Let’s take a peek at what was completed for the month of March! I had one inventory piece that went out in the First Dibs Email and was picked up that week. 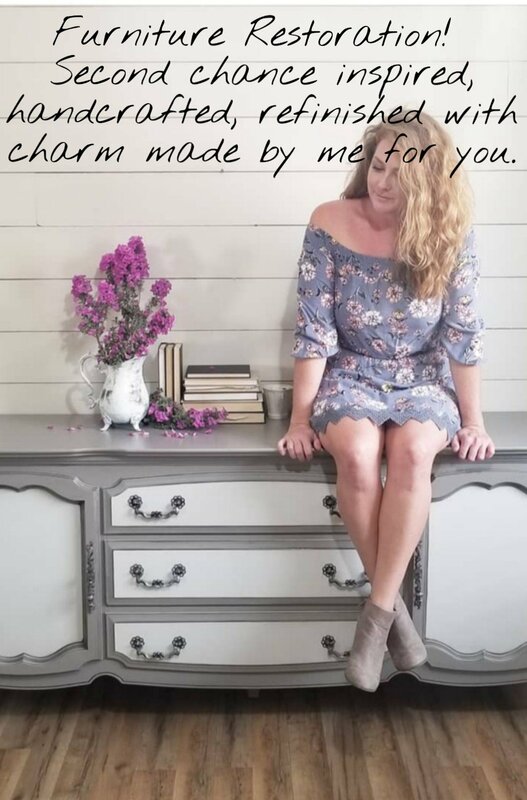 Visit Shop Selections to get on the First Dibs List and to see what is available in the shop for purchase that is already finished ready for your home! As always, you can view what pieces are available for customization over at In the Studio. I’m in love with each and every one of these pieces! I had the pleasure to complete my first ever piano alongside staining a table and bench that my client built. We are in the last phase of completing two home projects that have been on the paper for quite some time. One, of which took me 2 years to find the perfect barn doors. There are a few sayings that come to mind about patience. Boy, did I have to remind myself countless times about waiting. Once I found my doors everything else seem to fall into place. Stay tuned in as I will share in detail in two different blog post about how I made space in my home into my official Boutique Room as well as what exciting task we did for our back patio ceiling!